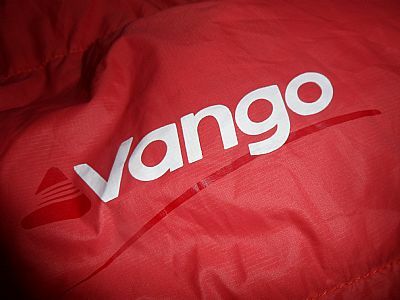 The Vango Venom 200 is a lightweight minimalist down sleeping bag. Weighing only 650g, the Venom 200 has been trimmed of all extraneous features; with only a half-length side zip and no shoulder baffle. It has 200g of 90/10 goose down (600 fill power), with a lightweight nylon shell and lining. The Venom features a “lightweight 3D hood with multi-cord closure for ease of use in the dark”. The multi-cord closure allows the hood to be tightened across the top and bottom independently (although if anything it’s not that easy to use). Overall the hood design and shaping is excellent. When cinched down it covers the head, leaving only a small opening to breathe and see out of, with an anatomical and form fitting shape to it. The pull cords themselves are integrated in to the insulation, thus alleviating the cold strip around the hood often seen on sleeping bags where the cords are effectively stitched on after the insulation. The left half-length zip on the Vango Venom 200 is a great choice on such a lightweight sleeping bag. A full length zip adds too much weight and is superfluous 99.99% of the time. The zip on the Venom is easy to use (both from the inside and outside). The internal baffle covering the zip is protective and helps to seal the sleeping bag in to preserve warmth. However, as with most sleeping bags it is still an area of weakness for heat to escape (it’s always a good idea to make sure the baffle is pulled across or tuck the zip underneath you to ensure minimal heat escapes). It would be great to see a no efforts spared version of the sleeping bag without a zip to see how much lighter and warmer (because of no weak spot for heat to escape) it could be made. Similarly to the PHD Minim 500 the Vango Venom’s lack of a shoulder baffle helps to minimise weight. However, this also means heat can more easily escape; to alleviate or prevent this it is really important to cinch the hood down effectively and tuck the sleeping bag in around the shoulders to minimise heat loss. The Vango Venom 200 has a comfort temperature rating of +10°C, a limit rating of +5°C and an extreme rating of -9°C. The temperature ratings on sleeping bags can be highly subjective and influenced largely by the individual (how warm they sleep, whether they are well rested or exhausted, whether they are dehydrated and the insulation provide by the roll mat to prevent heat loss to the ground). We have to be realistic about the relative warmth of a sleeping bag with 200g of down (There are many down jackets which have far more than 200 grams of down). From personal experience and testing the Vango Venom 200 provided a comfortable night sleep at +14°C (With only baselayer boxers). With the addition of more clothing (baselayer top, bottoms and a fleece) it would be possible to push it lower (However as mentioned above this is down to the individual). It is also worth noting that as with any sleeping bag (but especially with such a lightweight down bag) it is really important to maximise your insulation; by keeping it dry and allowing it to loft fully. Whilst the overall design of the Vango Venom 200 is excellent, the cut of the fabric is perhaps too wide for such a lightweight bag. The additional width means that there is effectively dead space within the bag, which subsequently requires your body to heat the extra air space. If the Venom was to be narrower it would eliminate the dead space but also increase the overall warmth as the insulation would be packed in to a smaller space, subsequently trapping more heat. On an expedition type sleeping bag the additional space may be more welcome, but on a lightweight bag such as this a warmer night sleep would be a better choice than the extra space (assuming a fast and light approach for quick hit trips e.g. 1/2 nights). This additional width continues to the foot of the sleeping bag. The panel at the base of the Venom 200 is the right size however the additional width makes the foot of the bag feel quite loose. If the overall width was reduced or a more aggressive tapering shape (i.e. to narrow significantly towards the foot of the bag) then this would prevent the looseness at the base of the bag. Excellent hood design and shape. Simple and effective half-length zip. Multi-cord hood closure allows different amounts of tension across the top and bottom of the hood. Hood cords are integrated in to the insulation, alleviating any cold strip around edge of the hood. Lack of a shoulder baffle means heat can escape more easily. Overall width is too wide on such a lightweight sleeping bag (also in comparison to other lightweight bags). In summary the Vango Venom 200 is a well-designed lightweight sleeping bag. It would be a great choice for British summer time (>+10°C) fast and light trips or perhaps even going hut to hut on a summer alpine trek (for a bit more comfort than a sheet sleeper and itchy woollen blankets). An overall narrower design or a more aggressive taper to the bag would make this a warmer and lighter weight bag capable of punching well above its price. The Vango Venom 200 on review here was provided by Silverfox Travel & Outdoors and is available to purchase here.